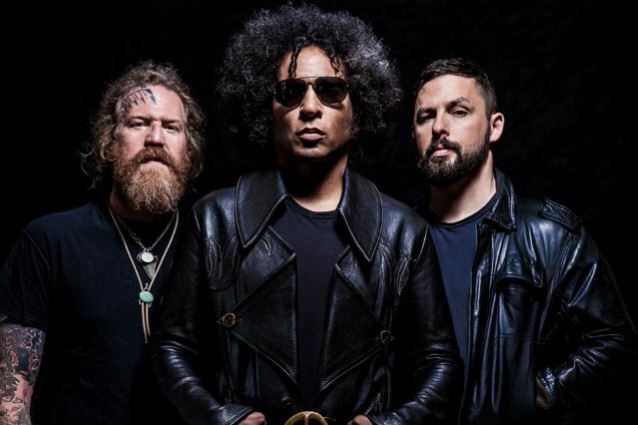 ALICE IN CHAINS singer William DuVall is fronting a new act called GIRAFFE TONGUE ORCHESTRA, which is also comprised of members of MASTODON and THE DILLINGER ESCAPE PLAN. While the lineup has changed since the project was launched in 2012 — with actress and singer Juliette Lewis allegedly fronting it at one point — DuVall has apparently settled into the lead vocalist position. GIRAFFE TONGUE ORCHESTRA founder Ben Weinman (also of THE DILLINGER ESCAPE PLAN) said that Juliette Lewis was never the singer but had contributed some material, adding: "She did some cool vocals on some of the GTO stuff. Actually, William from ALICE IN CHAINS is who has been singing with us." Weinman noted that most of the music for GIRAFFE TONGUE ORCHESTRA's ten-song debut album had been written before DuVall joined the band. "But everybody is definitely in this band," he said. "It's a real democracy." He added: "It's a little different for me. It's been great. Because DILLINGER has obviously been my baby since the beginning. You know while everyone contributes, it has always been my vision and baby. So, with GTO, it's really a combination of all the elements, all the pieces. So it's really interesting. It's been great for me to collaborate like that. And I think when you hear it, it really does sound like all of us in one band somehow." GIRAFFE TONGUE ORCHESTRA — whose lineup also includes Brent Hinds of MASTODON — will make its live debut at this year's Reading (August 27) and Leeds (August 28) festivals in the United Kingdom. From adventurous progressive-metal epics like "Crucifixion", "Broken Lines" and "Fragments & Ashes" to pounding rock anthems like "Adapt Or Die" and "Back To The Light" (featuring a vocal cameo from Lewis), to future crossover classics like the gorgeous power ballad "All We Have Is Now" and the electrifying made-for-radio dance-rock of "Everyone Gets Everything They Really Want", and the album's equally propulsive first single, "Blood Moon", GIRAFFE TONGUE ORCHESTRA's debut album promises to be one of the most exciting releases of 2016.